Unexpected Homeschool: We Remembered... Pi Day! So, I completely missed writing anything here for about two weeks. It's been a hectic and full two weeks around our house. There are some additional things going on in our lives right now, besides the normal, every day, crazy homeschool life. In preparation for each of the past two weeks, I dutifully scheduled lessons plans for various subjects to be active, taking into account the known events & issues of the week. By Monday of both weeks, I simply hoped to complete anything on the schedule. Yesterday, March 14th (3/14) we had a break from all regular school subjects and celebrated Pi Day in our school. Amber has longed to do this for years. Her first parochial school allowed the 8th graders to celebrate Pi day, the rest of the grades did not. 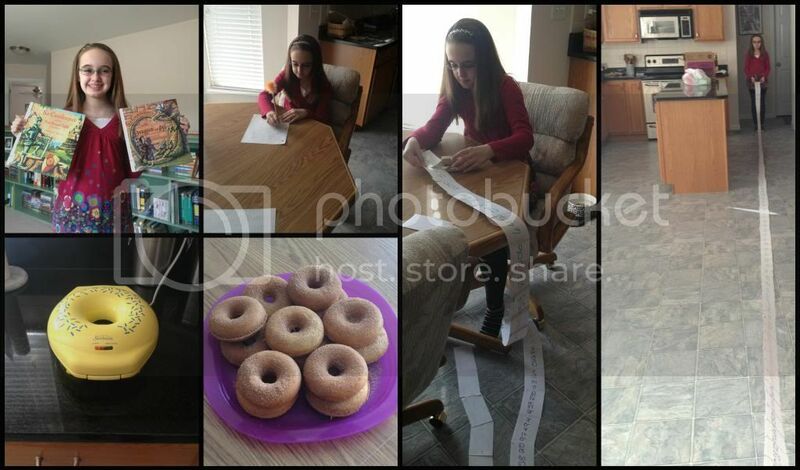 Last year, our first March of homeschooling, we completely missed Pi day (Ok, It was my fault. I lost track of time). This year it has been on the calendar for months. We celebrated Pi Day by starting with a math lesson, of course, and moved on to reading two Sir Cumference books. Amber LOVED the books. We read aloud Sir Cumference and the First Round Table, and Sir Cumference and the Dragon of Pi. Amber was laughing the whole time, and found the names of all the characters to be hilarious. We ate round things all day, like homemade cinnamon / sugar donuts, a shared giant cookie, round sandwiches & pancakes. We even ran an errand to Target (the round logo there was just a bonus, we were in desperate need of a few things). Amber wrote Pi-ku's for over an hour and thought it was the best part of the day. Almost every one of her Pi-ku poems had the word "pie" in them too. Most were very silly, but she had a great time. Amber also assembled a Pi-chain of 85 notecards that I had already prepared with the first 350 digits of Pi. She had fun stringing it around various places in the house to see how far it went. It barely fit in the kitchen! Lots and lots of language arts (and Latin) happened in Amber's school the past couple of weeks. The majority of this can be independently done after some direction and instruction from me, so these were our go-to subjects lately. I do love it, though, that her English grammar lessons and Latin lessons are complementing each other right now. Each one has her patterning sentences (SN, V, PrN, PrA, etc.. ) and while she has been doing this for a while, it is wonderful to see her act like it is no biggie in both languages. The perfect tenses were especially helpful to have studied in English before trying to understand their function in Latin. Amber has also been working on a great deal of independent Social Studies reading and question answering. We are approaching WWII, and I very much want to make this an interesting history area for Amber. My time right now, however, isn't there. She is very interested in the pre-WWII events, especially in Russia. I may try to use additional reading resources to delay Amber from getting to WWII before my time allows me to interact with her in the subject more. Last weekend, besides the much dreaded time change, Amber also had a big day at church. 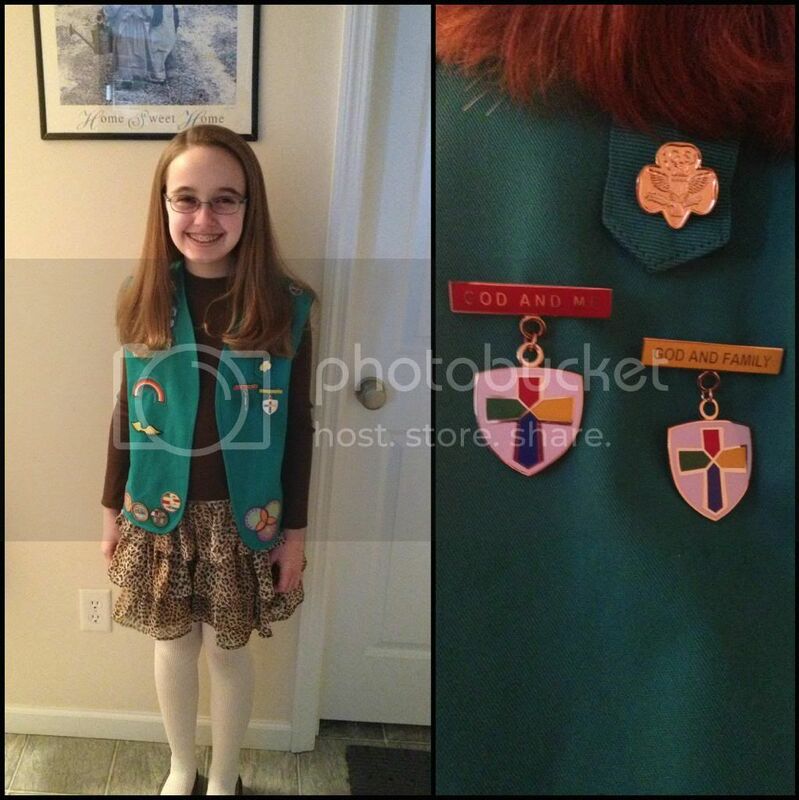 Amber's Girl Scout troop received their God & Family award at the beginning of the service. The troop stood in front of the congregation, had their names announced, and received their awards. I was so honored to be Amber's parent that pinned on the award. It was a proud day for them all. A milestone was reached early last week too, Amber officially completed all the school hours required by our state. No, she is not even close to finishing the school year, but technically we could halt 5th grade now. Seems crazy, considering today is the end of our 3rd quarter and she really does have a whole quarter of material to cover before I'm comfortable promoting her to 6th grade - at least to our 6th grade. In an unusual, but welcome, change for our family we have been doing a crazy amount of read alouds. One night last week Amber was particularly cranky and restless right before bed. Scanning around my bedroom while I was hiding, yes I hid from her for a few minutes, I saw the antique secretary desk with some of Fred's and my favorite childhood books. The majority of these Amber has already read, but she has yet to read the Lloyd Alexander series. I grabbed The Book of Three and called (er, bellowed) for Amber to join me. She acted grumpy and pretended to not enjoy it, until I quit. Then she had questions and couldn't wait for the next installment. We haven't managed to read aloud every night, but we are making progress. Amber also decided she wanted to read aloud to me then. My IBS flared up last week and I've had some rough nights and mornings lately. Amber has been a sweet little girl, inviting me to come lay on her bed with the new comfy pillow top for reading sessions. 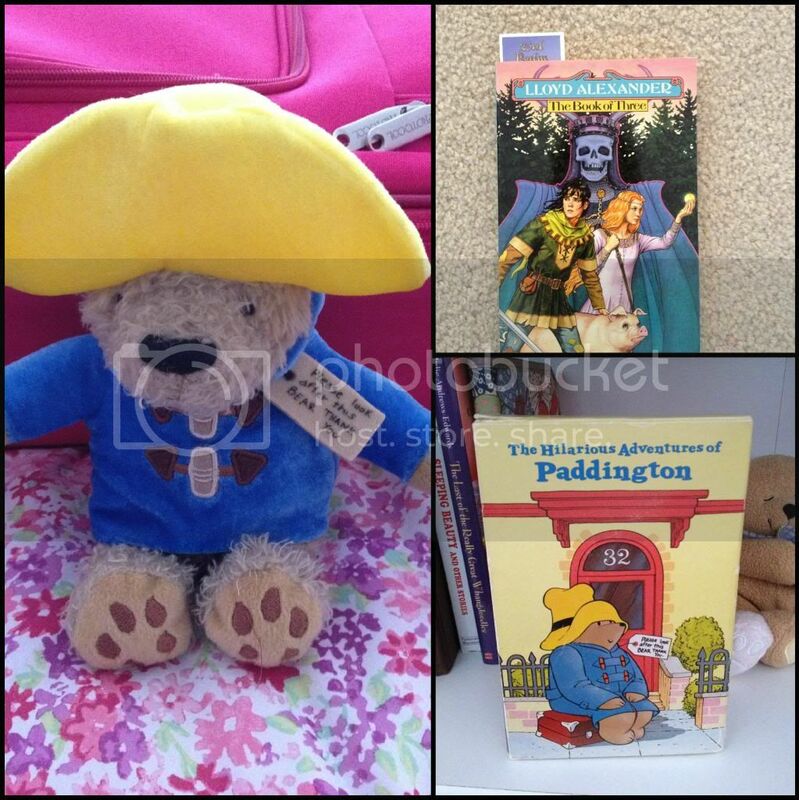 Each time she hands me her Paddington to hold while she reads from her dad's old set. We've read these before, but she finds them funny and comforting. It's what she wants to read me when I'm not feeling well. It's blissful. Last Friday was another Amber and Grandma sleepover, because Fred had another followup doctor's appointment at Barnes. Fred was finally, but with caveats, released from the surgeon. Surgery was June of 2012. He still has regular checkups with the endocrinology department and regular blood tests, but he is almost back to normal. They believe his energy levels will continue to increase over time. The surgeon couldn't stress enough how dire Fred's situation originally was. I was reminded again last Friday of how thankful we should be for everything and how generous our God can be. With all that is going on around here lately, we are trying to make a special point to spend focused time with Amber. She tends to just fade into her playroom when she thinks we are too busy to play with her, never asking us if this is the actual situation. 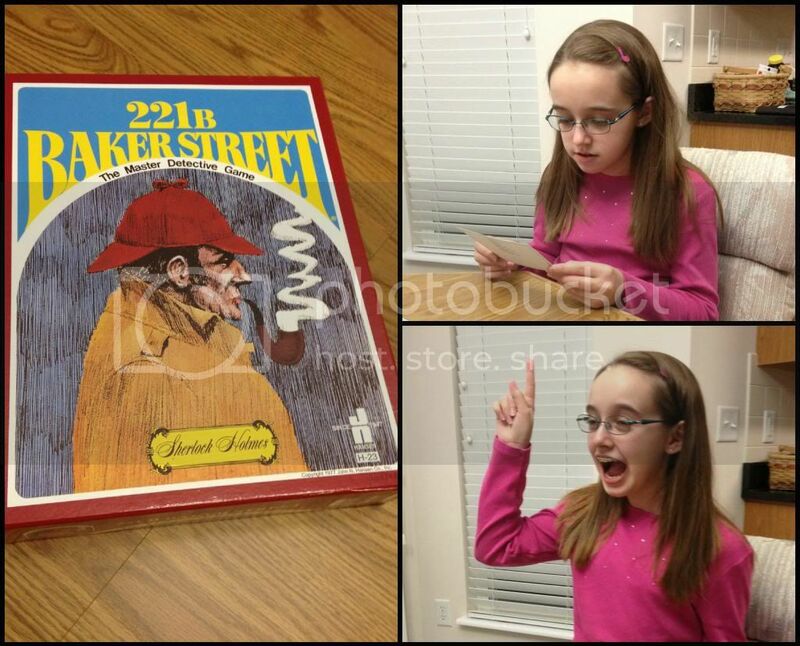 We have been playing a lot of board games, but the most prominent one is 221b Bakers Street. It's a Sherlock Holmes game where you travel to various points in London, acquiring clues in the form of puzzles to solve a mystery. There is a base story that gives you much of what you need to know, and the remainder are word puzzles found during game play. One of us normally teams with Amber, or we play as a family to solve the mystery, because Amber doesn't have enough knowledge to solve some of the clues. However, she is learning fast and LOVES this game! 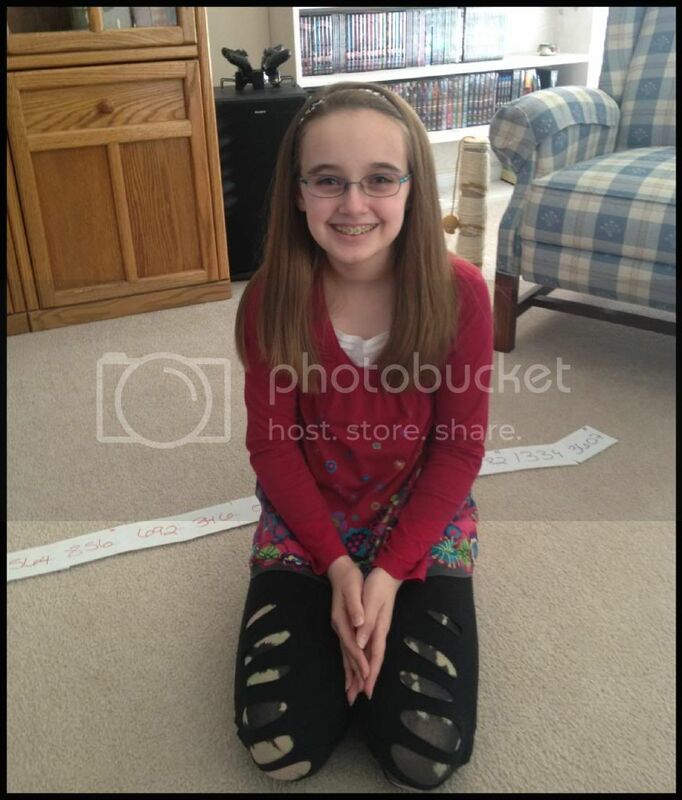 Over the past couple of weeks Amber has completed the first portion of her Astronomy unit and aced the test. The child really has an affinity for physics and astronomy. Unfortunately, after a freakishly warm early winter, we were hit with snow and far below normal temperatures during our astronomy study. We've been waiting to stargaze, but it hasn't worked out yet because nobody wants to stand out in 20 degree weather trying to adjust the telescope. Thankfully, we've had the telescope a few years and this is not a new experience waiting to happen. This week we moved on to the Solar System and are supplementing our normal curriculum with Lapbooking Through the Solar System from Elemental Science. We've only done one lesson in the lapbook so far, so I'll wait to write more about it until I have something useful to say. We did supplement the outer space portion of astronomy with online videos, Wonders With Brian Cox. We have only viewed the Universe videos so far, and will use the Solar System ones during our current chapter. I did have to prep Amber about Brian Cox though. He has a slightly different view of the universe than we do. Still, Amber especially enjoyed the graphics with his videos. Several times recently Amber has come to me with a craft or art project idea she wants to do. It isn't a kit, but something she has thought up. Of course, I jump at any chance to let her be creative when the mood strikes her. So far she has made felt & ribbon accessories for some toys, drawn a complete medieval city (and then redrew it revised), and knitted a hat for herself. 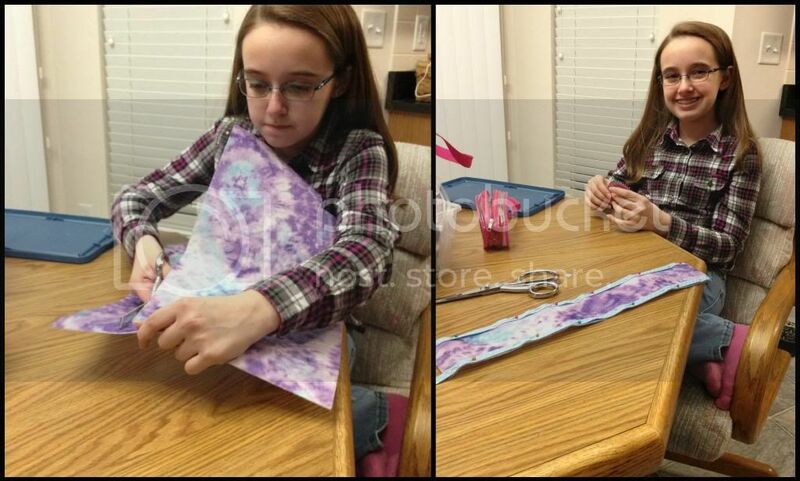 It's wonderful and a relief to see her being creative again and feeling more confident about her abilities. Again, we accomplished a great deal, just very little of it was planned in advance. I guess that is what life is generally all about. Your Amber makes me think of our Mei in lots of ways, but especially her glowing grin. Our daughter is an only child too, who looks to be about the same age, and who also loves her ponies <3! Wow! Like our required days, you don't have to stop just because you're reached them. Oftentimes we do more days then required just to wrap things up, although this year I'm thinking we'll end on time because we're needing that break! LOL Congrats though!